Let’s begin with a discussion of the perimeter fence, as it is of primary importance. 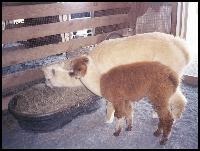 An alpaca’s only means of self-protection is to flee and we take that away from them by enclosing them in small spaces. Thus, a perimeter fence, which provides adequate protection from predators, is a basic requirement. Generally, the perimeter fence is of woven wire (2×4 or no-climb is preferred) with either barbed wire or electric wire along the exterior base to discourage digging. This wire is about 6 inches above the ground level. Also on the exterior, we recommend an electric wire about 2 feet above the ground to discourage predators from climbing in. The most effective electric box is the New Zealand variety, which packs a much greater punch than those routinely found in farm stores. The only source (that I know of) for these boxes is from someone who installs high tensile electric fencing. In our area of central Virginia, the primary predators are dogs, but we also have coyote, bear, and bobcats, which all pose a threat to alpacas. So, your perimeter fence should be at least four feet in height, and higher is always better. While I am talking about predators, I will also mention that we employ two Great Pyrenees dogs for protection. For little more than the cost of dog food, I have ’round the clock security. 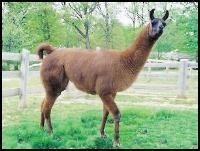 In the cria paddock we also have a llama to provide an additional level of defense. Young guard dogs may not be completely trustworthy with young crias, as frolicking crias are often too much for a playful puppy to resist! A good guard llama, like Heather Marie, should discourage any rough play. Pasture requirements are minimal, except it would be a kindness to offer them sufficient room to run. The rule of thumb is no more than 8 animals per acre, although I know of instances of greater numbers than that. One man who has 13 on one acre claims he still has to cut the grass! However, I like to opt for lower population numbers, as in dry weather you can find your paddocks overgrazed in a hurry. There should be a number of separate areas for segregating the males from the females. Ideally, you would have separate paddocks for breeding males, breeding females, and weanlings/juveniles. While discussing the ideal, a separate facility for the males would make life simpler. However, you can get by with mixing your animals a bit more, particularly when you are small and have only a few in each category. When planning your shelters and pastures, always plan for expansion – these animals are irresistable! The interior of your barn should be as flexible as possible. Moveable partitions (corral panels) work well. Swinging gates can also be stratigically placed to change the configuration of the stalls. You’re only limited by your imagination! Alpacas are herd animals and like to be together, but can be stressed by cramped quarters, particularly at feeding time. 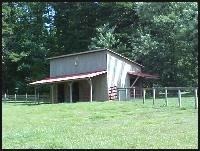 I prefer an arrangement with a feeding station for each animal, and try to limit it to no more than two per stall. I use moveable plastic feeders that hang along the fence. Hay stations can be shared by a number of animals, providing there is good access for all. I recommend that the hay be fed from the ground, tubs have worked great for me. Using the tubs allow the alpacas to eat in a natural position, keeps the hay clean, and helps to keep their fiber clean. 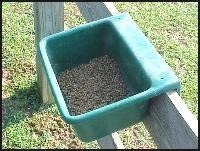 Rubbermaid makes a durable water tub with rounded edges that works well as a hay container. You could also purchase a wooden hay box that holds a standard bale. It has a grate to hold the hay in the box, allowing the alpaca to remove only a mouthful at a time. 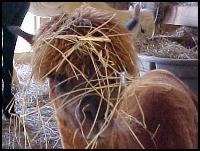 I would discourage you from using vertical racks, as much of the hay would end up decorating their fiber. In your cria stall you can use the 50-gallon Rubbermaid tub which is low enough for the babies to use. This winter we added automatic waterers to the girls’ barn and are delighted with them. I wish that we had installed them long ago! The boys still have heated buckets, which work well, but we plan on upgrading them also. If constructing your barn, give some thought to the flooring. There are a variety of materials available. I have seen rubber mats used over concrete floors – which are very nice, but a bit pricey. My experience is limited to dirt floors. In our girls’ barn, we use a fine gravel called screenings. We’re experimenting with using gravel dust in our boys’ barn. It’s put in about 6 inches thick, wet thoroughly, then packed with a roller. It seems to generate less dust than the screenings, but is very hard to come by — at least in our area. If you have a hard packed dirt floor, you might be able to just leave it at that. Our base was pipe clay and very definitely required covering up. You might also use screenings or quarry sand around the exterior to cover any muddy spots or where you don’t want grass. If you opt for a concrete surfaces, you’ll probably not have to trim nails as frequently, but remember that exposed concrete can be very cold in the winter months. Alpacas are basically healthy animals and there is no disease that is specific to them. They are, however, subject to some diseases carried by other animals and require annual vaccination. We vaccinate based on the recommendation of our veterinarian, and suggest you do the same. 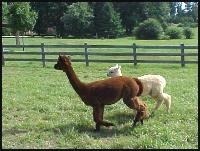 Alpacas need a regular program of worming, but the amount of time in between depends on the area in which you live. All areas east of the Mississippi have large populations of white-tail deer, carriers of the meningeal worm, which is a most dangerous parasite for alpacas. This worm attacks the central nervous system and can be devastating to the animal’s health. If you have white-tail deer, you will need to worm monthly. Always, always, always consult your veterinarian! Routine care won’t take a great deal of your time, but alpacas do require routine servicing! My daily chores consist of feeding, watering, and picking up the poop. I choose to feed twice a day because I like to. However, once a day is fine. My time spent at the barn is pure pleasure — Hutch has even offered to move my bed into a spare stall! There are several varieties of pellets manufactured for llamas and alpacas specifically. In our area we generally supplement with pellets. Further west, where the hay is of better quality, you can get by with only supplementing your late pregnant and nursing females. Mazuri, Buckeye, and Southern States lama pellets are all appropriate feed, and readily found. I particularly recommend the Southern States mix, if you can get it. It is reasonably priced, and provides for the animals’ complete nutritional needs. Dr Norm Evans has a pellet mixture which is also quite complete and is produced by Agway. In addition to pellets, you will need to offer clean hay, either one of the grass hays or a mixture of grass hay and alfalfa. Pure alfalfa hay is too rich in calcium and protein and will cause an imbalance of nutrients, as well as fat animals. Also, I like to offer a mineral mix, free choice. There are several products recommended for alpacas and may be purchased through any of the camelid supply companies. Fresh, clean water must be available at all times. It is not a good idea to have a source of water such as a pond or stream within your pasture area. They may stand in it in hot weather causing the constantly wet fiber to rot. It grows back, but you will have some unsightly animals until it does! We clean up the poop piles daily. I should note here that alpacas are very neat animals and their dung piles are often places for socializing. They all go in the same area and frequently at the same time. Clean-up is a breeze! Speaking of poop, if you haven’t caught a whiff – of that produced by alpacas – you’ll be surprised. I wouldn’t go so far as to call the scent fragrant, but I wouldn’t call it an odor either. We trim our alpaca’s toenails, if needed, when we do monthly worming. 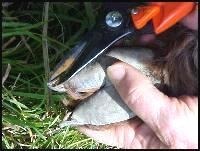 The regularity of trimming does vary from animal to animal and according to the surface they walk upon. We have grass pastures which don’t wear the nails down, so most of our animals require a trim every month or so. Of course, these are fiber-producing animals. We shear annually in the spring, which also helps the animals deal with our hot, humid summers. 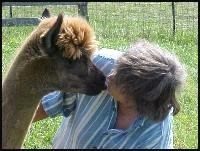 From past experience, I now shear ALL my animals in the spring, including the spring crias. They may appear too young, but they can grow an incredible coat by July or August and really suffer as a result. Actually, the quality of the fiber at next shearing is also greatly improved, as that birth fiber can be just like velcro! I rarely shut the animals up in the barn. The exception was the “Blizzard of 1996″ in which the wind and snow blew incredibly. I locked them up for two days until the weather calmed down, and I don’t believe any of them objected! Normally, they just need some shelter where they can get out of the elements in the winter, with straw bedding for warmth. The only other routine care is during the hotter months, as these guys are subject to heat stroke. This is a particular problem in the east where we have such high humidity along with high temperatures. You will need to provide shade and air movement for the hottest days. We use large industrial fans in the barns, placing them low to cool the alpacas’ bellies. Watching the ‘pacas hanging out in front of the fans, chewing their cud, will make you want to join the herd! 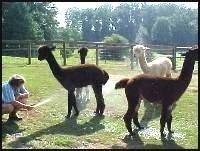 The most fun job for alpaca owners are hose parties. They get wet, you get wet, it’s hard to tell who’s having the most fun. Be sure to spray their bellies only, not the blanket area. Imagine wearing a wet wool jacket out in the sun, and you’ll appreciate the greenhouse effect as that wet fiber tries to dry. Trust me, stick to the belly. In central Virginia, our summers can get pretty warm. I like to spray almost daily. I’m not sure if it’s because I like to, or because the alpacas want me to — but we all have fun! Breeding camelids can be very interesting, as they are induced ovulators and unlike most of the species with which we are more familiar. They are unique to my experience, and that of most owners. There is limited space to go into all aspects of breeding here, but I would like to talk a bit about age. Females are capable of conception at quite a young age. At RCF, we always wait to breed until they are at least 18 months old, and prefer to wait until 24. It depends on the animal and the circumstances. Waiting a bit allows the female to achieve most of her growth before facing the demands of producing a cria. Long-term prospects for the animal are greatly enhanced by waiting a few more months before breeding. We not only refuse to breed at a young age, we will not purchase females that were bred at a young age. When we first got into the business, we were informed that males would not breed before 3 years of age. We bred our first male at 28 months and thought we were the cat’s pajamas! Now, I understand that some breeders are routinely breeding at 18 months. Hmmmmmmmm. This requires skill and knowledge on the part of the breeder, whereas if you wait until after 2 years, you can usually count on the male to do his part without your help! We clear out all the other alpacas and leave mom and baby in a separate area for several hours, sometimes with an experienced female to serve as auntie. If it’s a pleasant day, you might put them in a small paddock for a little sun, preferably in view of the rest of the herd. It is always nice if the herd can meet the newcomer through the fence, as they seem to be anxious to greet and welcome the crias. These gals know how to tend their young and do a good job of it. For further information, and more details, I recommend that you read the short book by Clare Hoffman, DVM, and Ingrid Asmus entitled Caring for Llamas and Alpacas, A Health and Management Guide. This book covers most of what you would need to know; and it has served well as a reference for me. I recommend it. In this section, I have tried to give you an idea of what’s involved in caring for these enchanting animals. Of course, there’s always more than one way to get the job done. I hope I’ve been able to help you in your quest for information. Call me if I can be of assistance, but most of all, remember to have fun!